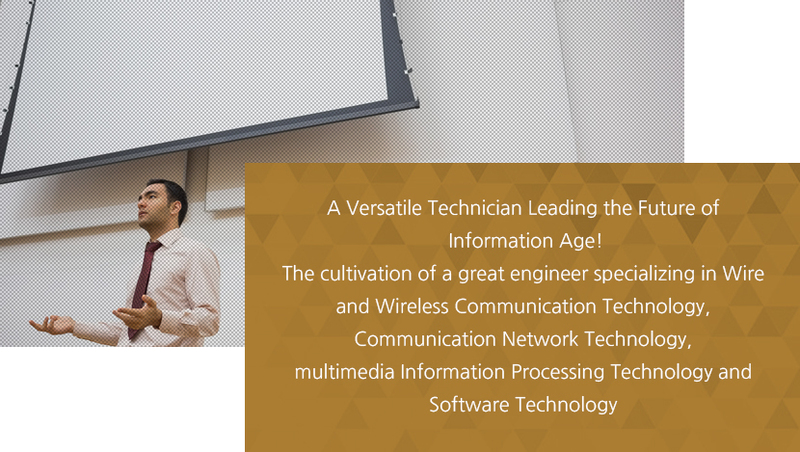 The School of Information & Communication Engineering has aimed to cultivate an great engineer specializing in wire and wireless communication technology, communication network technology, multimedia information processing technology and software technology, all of which are the backbone leading the future of information age. The core of Smart Phone, Smart Work, Smart City, and Smart Grid which have been emerging as trends and attracted a great deal of attention from public is information & communication technology. Jumping on this trend, the School has provided an intense curriculum to foster a student to be suited to the smart society and the future of information society. The School settled the consumer focused education system through the acquisition of Accreditation Board for Engineering Education of Korea(ABEEK) and the implementation of large-scale national projects such as BK21 Project, NURI Project, etc., and its members have made a great deal of efforts for its continuous improvements. Furthermore, the School has been focusing its efforts on fostering adaptability in industrial sites based on the reinforcement of education for theory and practical works, institutionalizing an in-depth guidance for students through the regular and frequent consultation in order to improve the career path and employment rate. The current state of employment after graduation The graduates are able to go into the field of communication such as communications equipment manufacturing, RF parts manufacturing, antenna manufacturing, etc., the field of multimedia information processing such as computer programming, audio and video, etc., and the field of information such as Internet service, and enterprise, laboratory, graduate school and more. In particular, the external recruitment in the field of IT has been expanded by government’s policy for boosting venture businesses, and diverse jobs such as freelancers, teleworking and startup are open to choose for graduates. Currently, the major states of employment has showed many conglomerates, including Samsung Group affiliate (Samsung Electronics, Samsung SDI, Samsung SDS, etc. ), LG Group affiliate (LG Electronics, LG Philips LCD, LG, CNS, etc. ), SK Group affiliate (SK Telecom, SK Corporation, etc.) and Hynix, many small and mid-sized venture businesses such as Ahnlab, NAVER, Daum communications, etc., and other various related public corporations.